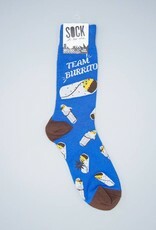 The question perhaps as old as time itself... are you Team Burrito, or Team Taco? 53% Polyester, 44% Cotton, 3% Spandex. Made in Korea. Sock It To Me threads are certified by OEKO-TEX® Standard 100; free of harmful chemicals to keep your skin safe and happy.